Immune Protect with Paractin contains a combination of patented ingredients that have been clinically shown to boost immune function, increasing the body's natural ability to combat challenges. Immune Protect with Paractin provides 100 milligrams of a proprietary, patented form of beta-glucan that has been proven to activate the immune system's primary defenders: phagocytes and natural killer (NK) cells. The immune cell-priming capabilities of this patented, highly purified yeast derivative exceed those of all other sources of immune supplements tested to date. The formula contains Paractin, an extract derived from an herb that has been used in Asia and India for thousands of years to fight inflammation, and provides significant seasonal support. Among the active ingredients of this medicinal herb are andrographolides, phytochemicals that exert powerful immune-boosting effects on the human body. The formula's patented blend of these andrographolides helps reduce damaging inflammation caused by cytokines, easing symptomatic discomfort and speeding recovery. 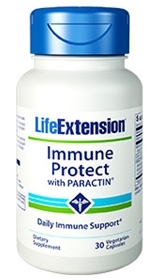 Only Immune Protect with Paractin contains both beta glucans and Paractin to help boost immunity and fight inflammation. Immune Protect with Paractin also provides 250 milligrams of a standardized extract of ascorbic acid derived from the most potent source of natural vitamin C: the camu camu berry. The fruit of the camu camu has the highest recorded amount of natural vitamin C--over 30 times that of an orange. Other ingredients: vegetarian capsule (HPMC and water), cellulose, silicon dioxide, magnesium stearate. Contains gluten and corn. Contains yeast. This product contains NO milk, egg, fish, peanuts, crustacean shellfish (lobster, crab, shrimp), soybeans, tree nuts, wheat, or rice. Contains NO artificial sweeteners, flavors, colors, or preservatives. PARACTIN is a registered trademark of HP Ingredients. WGP is a registered trademark of Biothera...the immune health company. WGP is exclusively distributed by the ET Horn Company. Take one capsule daily with water 30 minutes before a meal, or as recommended by a healthcare practitioner. Increase dose up to six capsules daily if needed.